Pair this comforting mash with a warming casserole for a match made in heaven. Put the carrots, sweet potatoes and garlic in a large pan of salted water, bring to the boil, then cook for 12 minutes. Add cumin seeds, butter and seasoning, roughly mash, then serve immediately. 66 members have added this recipe to their cookbook. Quick, easy and tasty. Great texture for sandwiches. Simple and quick basic cookie dough. Homemade crackers full of nutritious seeds. Low carb and gluten free pancakes. 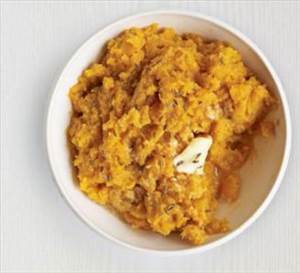 There are 209 calories in 1 serving of Carrot & Sweet Potato Mash. Calorie Breakdown: 23% fat, 71% carbs, 6% prot.